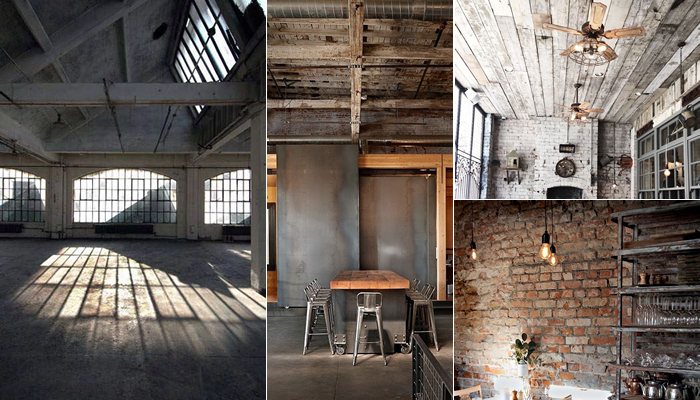 The industrial or “loft look” has become a huge interior design favourite within the hospitality sector over the last few years. The great restaurant chain “Bill’s Restaurant” has done a fantastic job with this design choice and even Nick’s Bistro in Coronation Street has jumped on board! How could you create this great look? We have found inspiration from the “catalogue of ideas”, Pinterest, having created our own board for some inspiration. Using these great ideas and breaking the space down, we have a few tips and hope that they are helpful! The room structure is the main canvas for creating your loft finish, so you need to make sure that it gives the right impression. Raw materials such as wood and metal will become your best friend in the process. Exposed beams and pipelines are a favourite as they create features within the room itself. Wooden ceiling panels and exposed brickwork on the walls are a lovely finishing touch. It is also very important to allow for as much natural light as you can to create a vibrant space. If your venue includes a bar counter, you can create this to become the main centre piece of the café/ restaurant space. You can create a masterpiece that your guests will find difficult to take their eyes off, leaving that all important “lasting impression”. 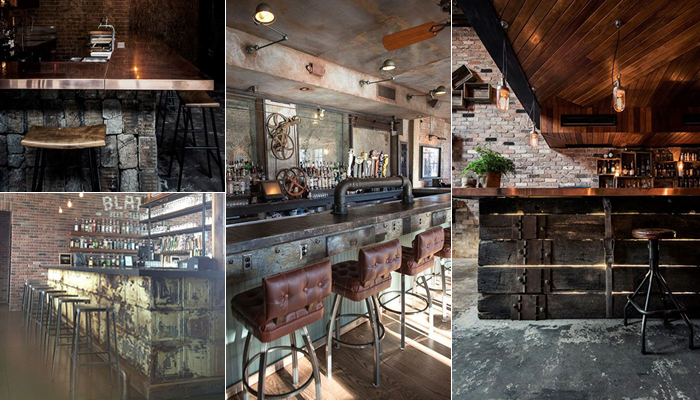 Raw materials remain an importance when designing the bar area and subtle lighting is a great touch. Often brass and stainless steel is used on the bar tops, not only to complete a great finish, but it is also easy to keep clean. Don’t forget the other side of the bar though! Give visitors something great to look at, especially if you have seating by the bar. “industrial materials”, equipment and contemporary shelving that display drinks would be a great touch! Lighting fixtures are a real attribute to any venue, especially one that involves a warehouse style finish. 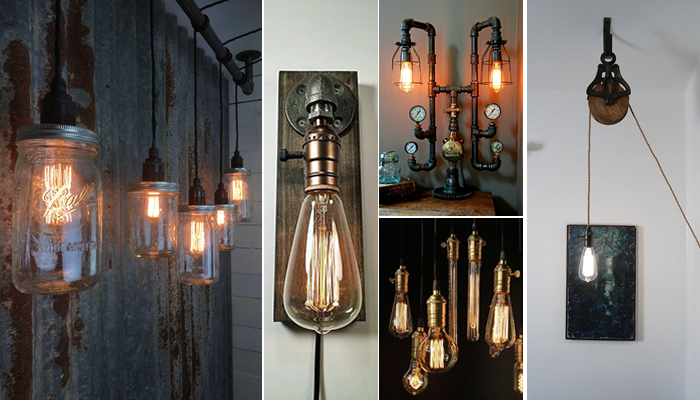 Creating a “steam punk” look is a great way to achieve the industrial fashion. Quirky light shades, such as jam jars, or stands made from pipe works are a fantastic idea to create a lasting style. Subtle, low lighting will make sure that enough glow is reflected from the other raw materials used throughout the room. All this combined will ensure that a stylish, soothing atmosphere is created. 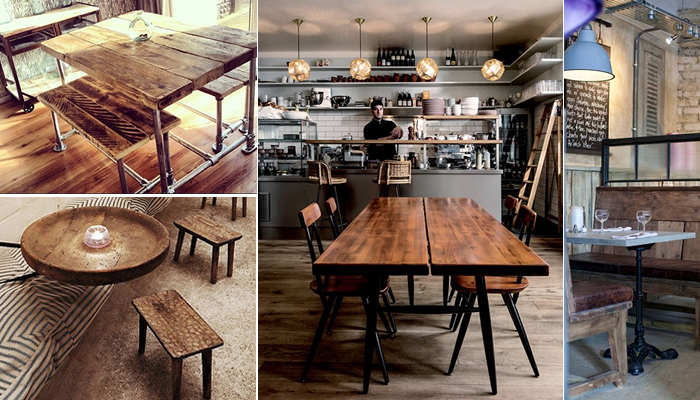 Optimise the dining experience that you offer your customers by allowing them to sit at great table sets. 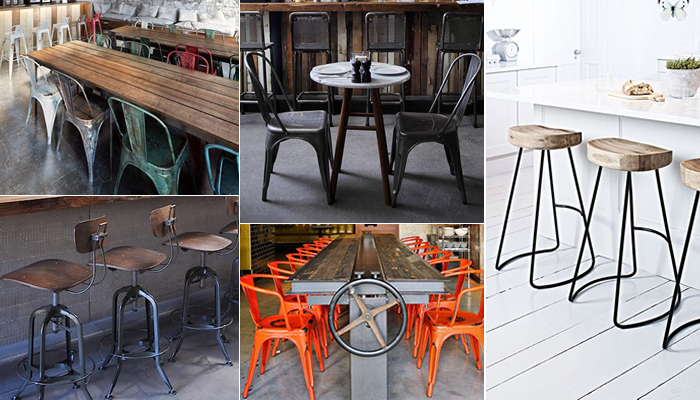 A mix between solid wood and cast iron or steel frames is a desirable choice. From continental style bases to a “scaffold” style bench, the possibilities are endless! All of these will also complement the overall look of the rest of your venue area and will have plenty of customers leaving wanting more. The timeless classics are a preferable choice to create the best industrial theme finish. Hairpin high stools, Tolix armchairs and the Emeco 1006 style chairs are the top 3 choices to have implemented within the seating spaces. Chairs are also a great way to throw in a splash of colour into the restaurant, creating elements of light! You will be able to create a rustic, bright finish that will leave a lasting, enjoyable impression. Probably the most straightforward, but a very important factor when it comes to completing this desired look. Sticking to raw, industrial style materials choose a floor that looks impressive and matches the style that has been chosen for the rest of the venue. 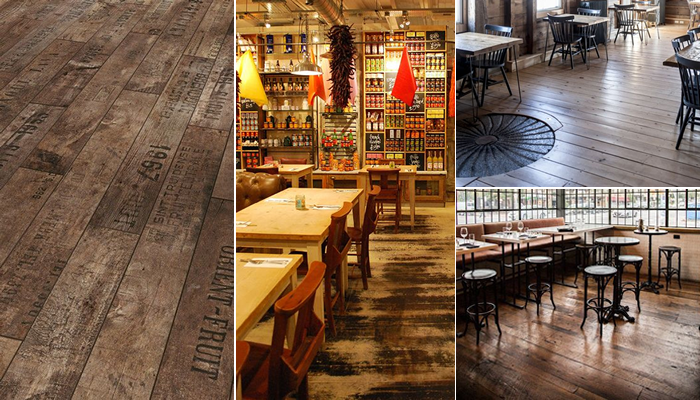 Wood and metal elements are once again the materials to recommend, as well as rustic tiles for an exotic feel. Do you have any other tips or suggestions to create this fantastic design? Make sure you let us know in the comments below!